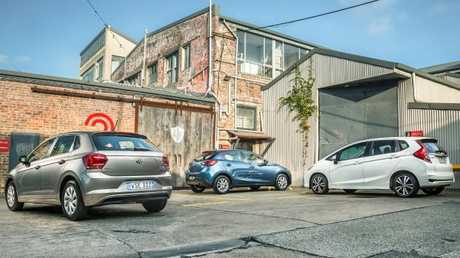 Tested: the new generation VW Polo (right) versus two other benchmarks of the class, the Mazda2 (left) and Honda Jazz (centre). Picture: Thomas Wielecki. CITY cars are the one-size-fits-all of the automotive world. They appeal to first-timers, old-timers and everyone in between. Able to carve through traffic and squeeze into tight parking spots, they also help us cope with increasingly congested cities. There are two dozen in the class but we've lined up the first new VW Polo in six years alongside two of the category's best, the Mazda2 and Honda Jazz. Cream of the category: Mazda2, Honda Jazz and VW Polo. Pictures: Thomas Wielecki. The Jazz starts at $17,990 drive-away with auto but jumps to $23,100 drive-away for the VTi-S tested here. 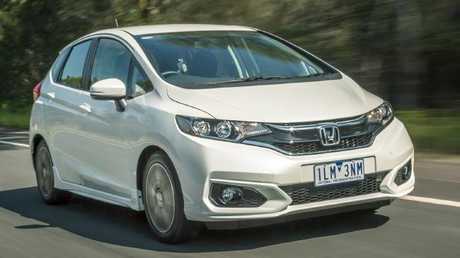 The Honda Jazz has a roomy cabin, but a high price and a lack of tech weigh against it. This price is way over its rivals but it's the example Honda put forward. It had been the most metal for the money - until the new Volkswagen Polo came along. The Jazz's roomy cabin has clever rear seats that fold flat to create enough cargo space to almost classify it as a small van. If you need to move large loads look no further. Straightforward buttons and dials are easy to use and there is ample storage in the door pockets, glovebox and centre console, plus up to eight cup holders. The instrument display looks futuristic though a digital speed display would be a welcome addition. There's no Apple CarPlay or Android Auto (the smartphone tech is available on other Hondas but not this one) although there is built-in navigation. The sole USB port is hidden behind a tab on the audio unit. The audio touchscreen's lack of a volume knob is frustrating when on the move. As with the others there are steering wheel audio controls but they don't react as quickly as a volume dial. On the safety front the Jazz comes up short as the only one among this trio without autonomous emergency braking. It carries a five-star crash safety rating but, if tested to today's more stringent standards, it would likely be downgraded to four stars due to the lack of crash avoidance tech. Futuristic dash layout looks the part but lacks Apple Car Play, Android Auto and a digital speed display. 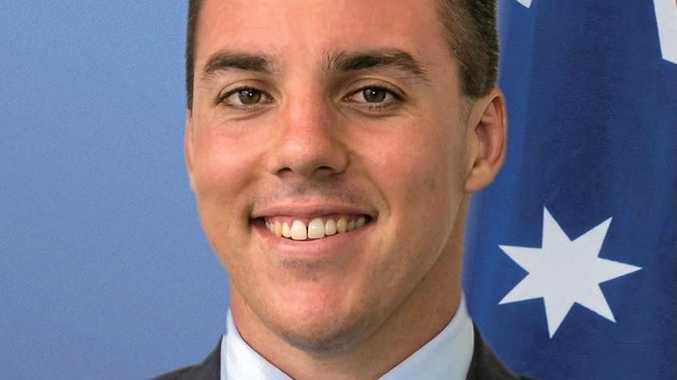 Service intervals are six months/10,000km, pushing the cost of routine maintenance over three years to an eye-watering $1935 based on the national average distance travelled of 15,000km a year. On the road the Honda makes fair use of the modest power from its 1.5-litre four-cylinder engine, matched to a continuously variable transmission that finds the best blend of performance and economy. Not everyone is a fan of the CVT's droning, which sounds as if the clutch is slipping, but it's effective and efficient. Road noise is on par with the Mazda2. It's fine around town but a bit rowdy on backroads. Comfort over bumps is acceptable rather than a standout. It doesn't handle corners with the same zest as the other pair but still feels sure-footed. Cute as a button, the Mazda2 is holding its age well. 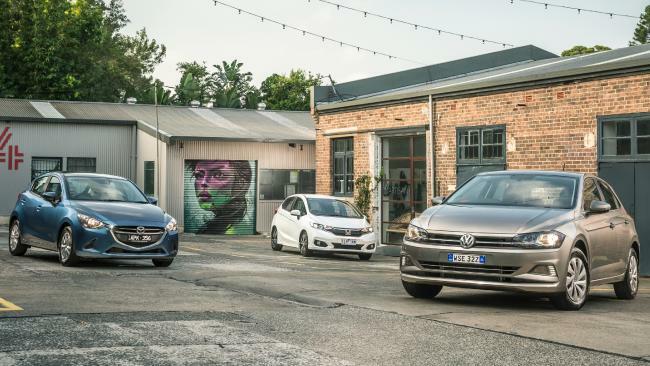 The range starts with the Neo at $18,990 drive-away but we've tested the Maxx at $20,990 drive-away as it lines up closest on price to the Polo. 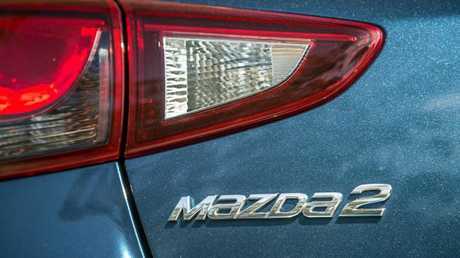 Mazda2: light, nimble, corners well, and steering is sharp. Noticeably smaller than the other cars here, the Mazda2 is lighter and more nimble. The interior is bland to look at but has a quality feel, with flashes of faux carbon-fibre on the dash and doors. Mazda has made good use of available space, although the rear door trims don't even get a drink holder. Apple CarPlay and Android Auto are absent but it comes with built-in navigation. Mazda's unique control dial and buttons are mounted conveniently in the centre console. It's the only car of the three with the convenience of a sensor key and push-button start. On the safety front, city AEB, six airbags and rear camera and sensors are standard, likely enough to retain its five-star rating if assessed today. 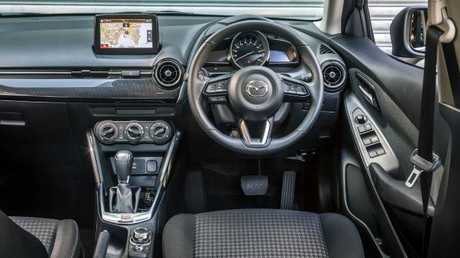 Mazda2 lacks smartphone mirroring but has built-in navigation. Service intervals are 12 months/10,000km. Drivers who do an average 15,000km a year will need four visits over three years, which pushes the cost to $1361 once you add items in the fine print on Mazda's website. On the road the engine has slightly less power than the Honda but it works well with the conventional six-speed auto and lighter body. As with the Honda, it runs on regular unleaded. The Mazda has a more sure-footed feeling in corners than the Honda and the suspension feels less floaty. The steering is well weighted and precise, a Mazda trait. The Polo has grown in every direction, even if it looks small in the photos. The VW Polo has superior ride comfort and road holding and a smooth and thrifty three-cylinder turbo. 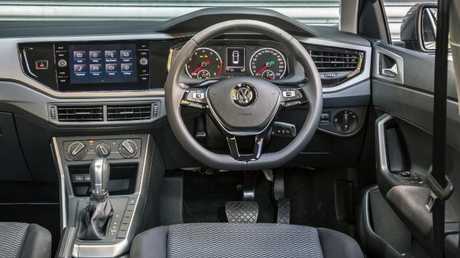 The interior could be from the next class up, with massive door pockets and large high-resolution touchscreen (with dials for added convenience). All the materials have a quality look and feel. 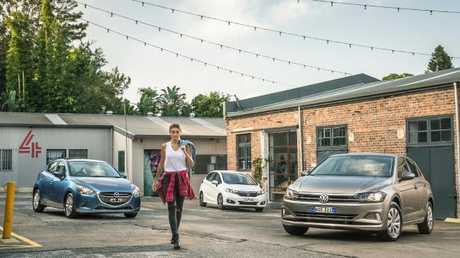 As the latest arrival of the three, the Polo has the longest list of standard equipment, even in this 70TSI Trendline base model, from $20,490 drive-away with auto. Standard fare includes Apple CarPlay and Android Auto, digital speed readout, autonomous emergency braking, rear camera and full-size spare - the only one of the three so equipped yet its cargo hold is almost as big as the Honda's. 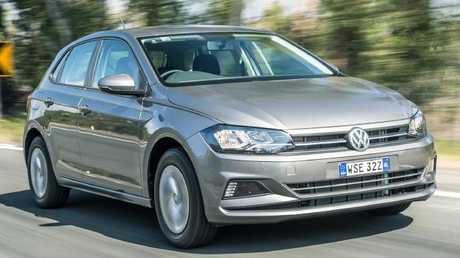 The Polo earns a five-star safety rating in standard guise. An optional $1400 safety pack adds radar cruise control with automatic stop-and-go in traffic, blind zone warning, rear cross traffic alert and "manoeuvre braking" that automatically brakes in forward or reverse up to 10km/h. 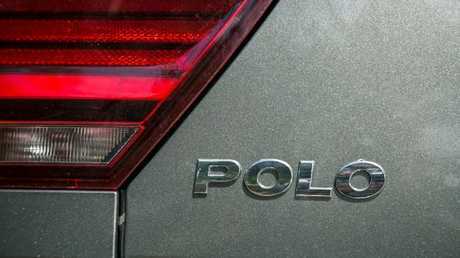 Where the Polo really shines is the way it drives. With the biggest footprint here it has the best roadholding by some margin and is also the best at absorbing bumps. The Polo’s classy and spacious cabin stands out among city cars. The other cars have alloy wheels but the plastic trims on the Polo's steel wheels look neat and are cheaper to replace if you scratch a rim. Its tiny turbo 1.0-litre three-cylinder is surprisingly refined and doesn't hum or vibrate like other three-cylinder engines. It has more urge than the others once on the move and makes good use of the seven-speed twin-clutch auto. Older versions of this type of gearbox were prone to delays and shuddering but the latest iteration is a smooth operator. One downside: the Polo demands 95 RON premium unleaded. However, for that you'll be rewarded with frugal fuel economy. 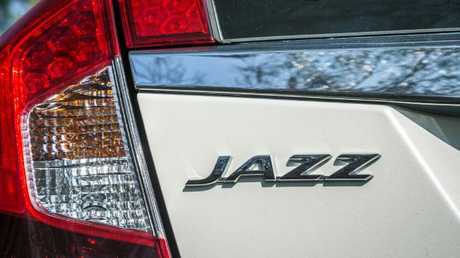 The Honda Jazz is roomy but too expensive and lacks key features and safety technology. 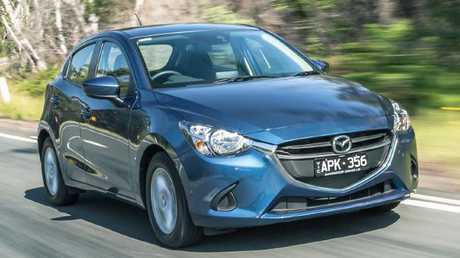 The Mazda2 is fun to drive and reasonably well equipped. However, nothing comes close to the Polo. It's the most complete package, it's sublime to drive and the cheapest to boot. Location: Precinct 75, St Peters, NSW, www.precinct75.com.au.